A great danger awaits, hidden in the shadows. 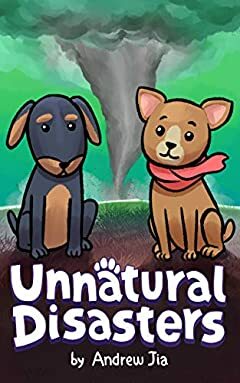 For fans of the I Survived series, Because of Winn-Dixie, and Chasing Helicity, natural disaster survival adventure book, Unnatural Disasters is the debut novel of Child Author, Andrew Jia. The city of Barlock has always been vulnerable to destructive natural disasters, but not on this scale. The flood of the century has uprooted the lives of ten puppies, and from there, they will come back strong, and recover quickly. Doby never supported the move to Barlock. Tescumah was the ideal city to live in. In between the Raw Mountains and the Tescumah Bay, it had the best views in all of Puppyland. Barlock, on the other hand, was a city decimated by natural disasters and nearly bankrupt. But it had to be done. His cousin, Nanook was sick with a disease, and moving to Barlock was the only way to find cheaper doctors and housing. Trapped in a horrible orphanage, Cavachon is trying to form a band because he knows that itâ€™s the only way out. After the flood, Barlock was destroyed. Its orphanage was already overspilling, and now anyone who could adopt one of the doomed orphans is dead from the flood. The Battle of the Bands presents a unique opportunity, and now Cavachon is determined to win.